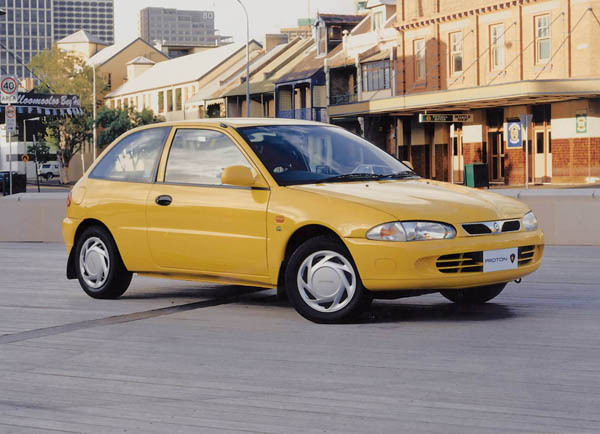 Proton Wira, Persona and Satria are some of the original Proton imports to Australia from the ambitious Malaysian car maker. Despite their varied titles, all three are virtually the same car. They are strongly based on old Mitsubishi Lancer models, Proton having been assisted by the Japanese giant in its early days in the vehicle making business. Build quality is good, if not quite to the high levels of Japanese makers. Reliability has also proven to be OK and Protons have been on sale in Australia for long enough to measure them against our tough driving conditions. Styling is relatively conservative, but this is paying off in the used-car field as the shapes are standing up well to the test of time. 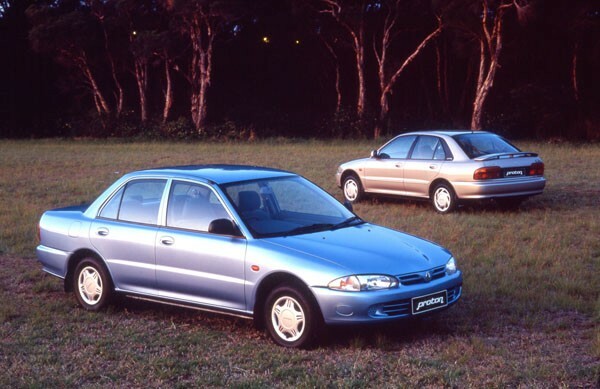 The Proton Wira four-door sedan and five-door hatch were the first off the import line, arriving here in May 1995. From November 1996, sedans and five-door hatchbacks were renamed the Proton Persona. 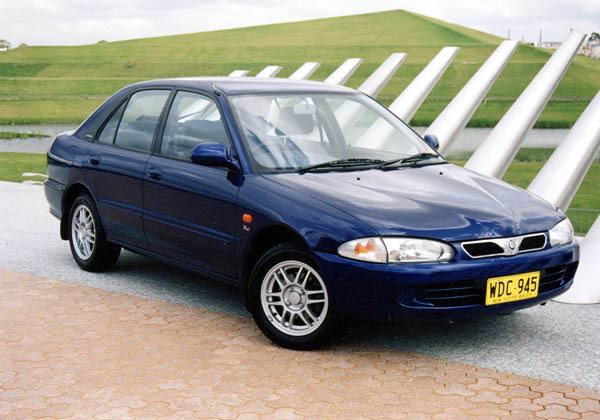 A couple of months later, in February 1997, a three-door hatchback variant, named Satria, was launched. The range received a strong sporting boost in October 1999 when the hot Satria GTi was introduced. The latter is undoubtedly the best of the bunch and we will return to it later. These Protons have good interior space in the four and five-door versions, though the three-doors are a bit cramped in the back seat. It’s not all that easy to get in there, either so the three-door variants are probably best left to singles or those with young families. Handling is competent in the standard models, though it has to be said it is set up more for safe understeer than the keen driver prefers. On the other hand the handling in the M21 Coupe is considerably better and that of the Lotus-inspired Satria GTi is brilliant. In an interesting move, all GTi Satrias come in the same colour, a sporting silver shade that works well, particularly as it’s teamed with a wide black rubbing strip and bold add-on flares. The lower cost Proton models use a 1.5-litre engine, the upmarket ones a 1.6-litre. Both are single-cam engines but the larger one has four valves per cylinder, the smaller unit three valves. The 1.8-litre unit used in the M21 Coupe and Satria GTi has a real sporting flair. The engines, which are still close in concept to the Mitsubishi originals, though these days are made by Proton, have strong torque and feel reasonably refined for what they are. Manuals all use a five-speed gearbox. The automatic transmission used with the 1.5 engine only gets three ratios and can be a bit of a slug. The larger engines use four forward ratios and have a fair bit more punch as a result. Insurance costs are usually moderate, but some companies may charge extra for the hot Satria GTi, or even the M21. The Proton dealer network is relatively small, but we have heard of no real complaints about getting parts or service. Spare parts prices are reasonable for cars in this class. Check for signs of the car having been in a crash. Look for paint colours that don’t match on adjacent panels, also watch for tiny spots of paint on unpainted areas such as the windows and badges. Look inside the engine bay and boot/hatchback in case shortcuts have been made in repairing these out-of-sight areas. Watch out for damage to the seats and other interior trim, including the carpet. Also check for fading of the plastic dashtop and rear shelf due to prolonged exposure to sunlight. Make sure the engine starts quickly and idles smoothly even when it’s completely cold. Once it has warmed up, the engine should accelerate smoothly, with no hesitation, and remain reasonably quiet at all times. Make sure the steering is positive in its action. Under heavy braking check the car doesn’t pull to one side or lock up one wheel before the others. Bounce the car one corner at a time to feel for shock absorbers that are slow in recovering from the movement. When buying cars sold in relatively small numbers it’s worth doing extra research amongst owners as there are few things worse than owning a car that later becomes an unwanted orphan.